Oigami Onsen is located in Tone-machi, Numata-City. 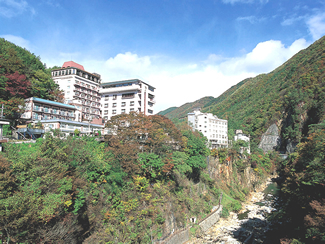 Situated between the mountains of Katashina Gorge along the road leading to Oze National Park, Oigami Onsen has a number of Japanese inns and hotels along the Katashina River. The Katashina Gorge is said to be one of the most beautiful scenic spots to view autumn leaves among the branches of the Tone River. Nearby scenic spots include the Fukiware Falls, which is known as the Niagara Falls of Gunma.